All transactions are safe and secure with a reliable history in online purchasing behind each of our associates. Buy the Walking Dead Costumes and Masks to own Walking Dead clothing and merchandise. If you've have ever dreamed of being a zombie or that you were being chased by zombies, then these Walking Dead Halloween costumes, masks and latex prosthetics will give you the look that you're after. 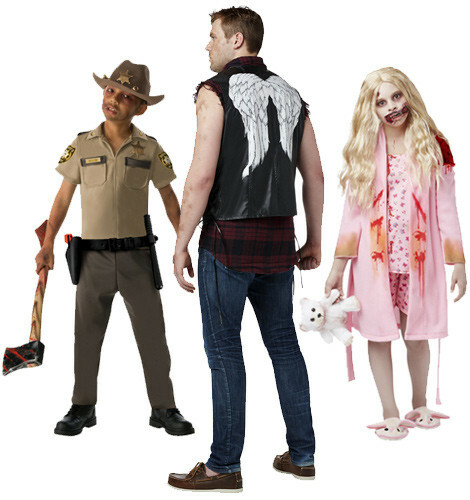 If you fancy yourself a zombie hunter then pick up a child, teen or adult Sheriff Rick Grimes costume. If you enjoy the gorier side of the TV show, then The Walking Dead zombie costumes, masks and prosthetics will give you that living dead look that will turn heads, while making it appear as if your own is going to fall off. In addition to the Walking Dead Costumes and Masks above, browse the Walking Dead Clothing Gallery for more apparel like men's and women's clothes, kids shirts or hoodies.